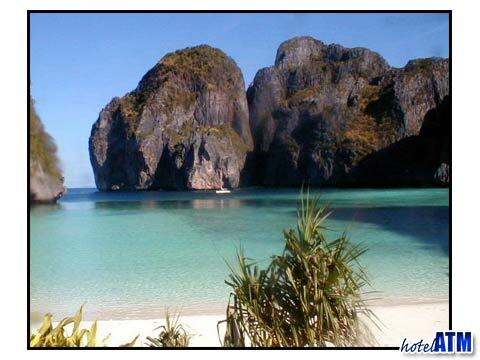 The Koh Phi Phi is a legendary group of islands in Krabi Province on the south western sea board of Thailand. 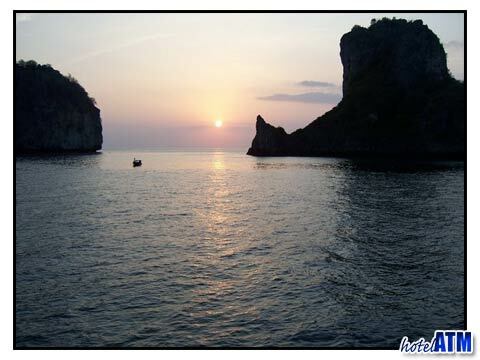 Phi Phi also boarders the Phang Nga Bay and is in the Andaman Sea on the Eastern Indian Ocean. Phi Phi Island sit about 42 km from Phuket and 38 km from Krabi Provinces. See the Phi Phi Map. The main island Phi Phi Don stretches 8 km long by 2.5 km wide and in the shape of a "dumb bell'. Phi Phi islands are dominated by mountains scenery, the villages and bungalows cling to the famous Phi Phi sandy white beaches. Phi Phi Island has been photographed more times than most islands in the world. The breathtaking scenery dazzles the eyes. It is no wonder that The makers of the Movie 'The Beach' chose Maya Bay on Phi Phi Ley Island as their setting of paradise lost. The smaller islands Phi Phi Ley is about 3.5 km long and 1 km wide. Uninhabited except for the Phi Phi Viking Cave birds nest company that stations a couple of guards to protect their caves, this is a pristine nature reserve. Entirely made from limestone cliff, this magnificent island draws the attention of the world to it's 2 major beaches, Loh Samah and Maya Bay. During the movie "The Beach" the film crew spent 10 weeks in Maya Bay and used a remote route from Loh Samah to bring the film equipment to the set. The other islands of Phi Phi, Bamboo Island, a 700 meter diameter circle of tropical paradise surrounded by coral reef and Mosquito Island, not surprisingly, famed for the black clouds of mosquitoes which arise only at sunset. This island is in the far north of the Phi Phi Islands and has dramatic white sand beach with color views of the Krabi seafront and gorgeous views of Phi Phi Don. The Bida Islands are off to the south of Phi Phi Ley. With no beaches these rocky atolls provide the famous deep diving reefs that Phi Phi is famous for. On the eastern side the reefs are about 8-10 meters deep but on the deep western side the wall drops to an impressive 32 meters. Here you can often see some of Thailand great marine life including whale sharks and manta rays in season. There are about 3500 rooms on Phi Phi Island of which 2300 are air conditioned ranging from the exclusive Zeavola Resort Phi Phi to the simple traditional Phi Phi family run JJ Bungalow guesthouse. There are still many "walk-in" guests who arrive off the boats hoping for the perfect accommodation but more and more hotel rooms are pre-booked as the island becomes more well known. There are 1,500 local inhabitants and about 500 people Chinese Thai and Western who work in the Tourist trades. The posy Tsunami village is up the mountain behind Long Beach but only accessible from Phi Phi Don Village up past PP Mountain View Resort. In Thailand hours of work are 08.30 till 17.00 p.m. but most family businesses open till 22.00. All shops on Phi Phi Island are open till 22.00 except the Dive shops that close at 21.00. The local currency is the Thai Baht. Please respect it, since the King's head is on the note. Thai people are sensitive to this. There are now multiple ATM's (cash points) in Phi Phi Don Village but travelers cheques and credit cards are the norm for Loh Bagao, Laem Tong and Runtee Bay. Most Internet cafes will burn you images from the memory card of your camera in Phi Phi Don Village. There is Satellite TV, CNN and BBC on the island. Most sporting events are available in the bars-Reggae Bar and Irish Bar. Most hotels do not have phone lines for their customers that can carry a digital system. Most people rely on the internet cafes to check mail and surf the web. Siam UK 70m from the pier has 16 computers, opposite Mama's Restaurant. See more for those who want to use their own laptops on Phi Phi island. There are government phones on the island. One is at the pier. Mobile phones work on most beaches on Phi Phi island. The small Phi Phi Island post office does post cards and inbound mail but is very simple island in nature. If you have something important use the main post offices at Phuket or Krabi. In Thailand is 220 volts and uses a 2 pin plug. Most international airport sell adapters for your electrical goods. The island has a local clinic but most people use the International hospitals on Phuket island. The pharmacies on Phi Phi are well stocked for most immediate issues.